This is going to take awhile. Cooking the meal, that is. See, I wandered around the supermarket so long that I meandered into the frozen vegetable section. Usually I just buy the fresh produce, but something was calling me. I somehow purchased a bag of frozen spinach. Now, mind you, I don’t even eat spinach on a regular basis – frozen or not. But I bought it and had to do something with it, which is how I ended up cooking so long over the stove that I could watch the majority of 50 First Dates while I waited for my meal to finish. It was about an hour, but believe me, it was worth it. In a heated skillet, add 3 tablespoons of olive oil. 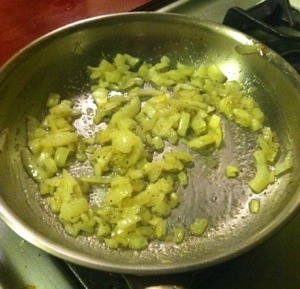 Add diced onions, garlic powder, and garlic. Let cook on medium-low for 20 minutes. You’re not looking to brown the onions, just make them translucent and soft. Add chicken and a dash of black pepper to pan and cook for 10 minutes on one side, then flip over and cook for another 10 minutes. Add tomatoes and spinach. The heat should still be low, so you’re not browning anything, just slow cooking. The chicken should be easily falling apart soon and should be able to cut chicken with a fork. 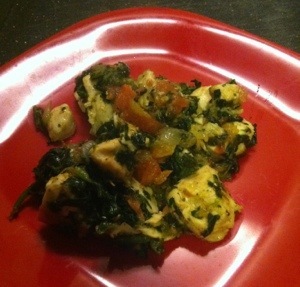 Cook for another 10 to 15 minutes or until spinach is thawed and the tomatoes have softened. If dish is try, add a splash of olive oil. Sprinkle with a dash of sea salt, fold into dish and serve.